​When families come to St. Ignatius School, they find a loving commitment to teaching and formation in the Jesuit and Holy Names traditions. As the primary mission of St. Ignatius parish, we want to ensure limited finances are not an obstacle for a child to attend St. Ignatius School. With your help and support we see a bright future. We believe in the transformative power of Catholic education. Since 1908, we have focused not only on academic excellence, but guiding children toward building a more just and compassionate world. That mission is strong today: 100% of our students are involved in positive change, including direct care of the homeless, companioning medically fragile children, connecting with the elderly and caring for the environment. Tuition only covers 70% of the cost of educating a child. The rest comes from community partners and donors like you. Currently, 33% of our children receive some form of financial support. Last year, with the help of the St. Ignatius School Foundation, we awarded over $110,000 in tuition assistance. As you consider making a gift this year, there are two ways to make a critical difference. – Partner with the school directly to offset costs, build programs and create emergency grants for families who face unexpected financial challenges. 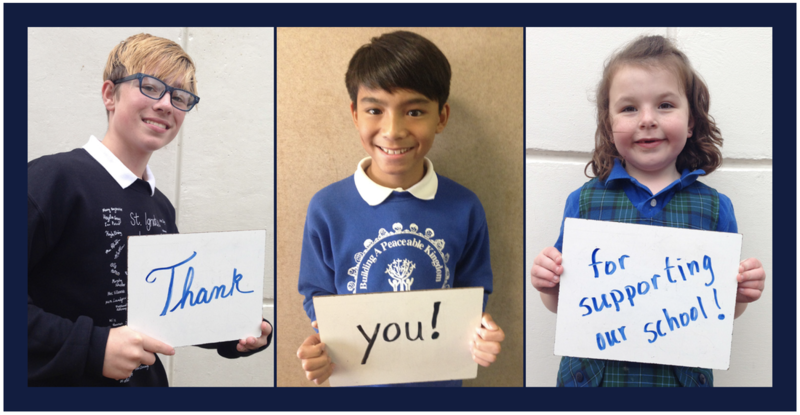 – Build the St. Ignatius School Foundation Fund, a growing endowment that will support the school’s mission far into the future. This year, the Foundation was able to contribute $80,000. Thank you for your generous financial commitment. We are so grateful for all you make possible.